My Little Patch of Sunshine: Review: "Why Do We Have To Go To Mass?" It seemed appropriate that I review this pamphlet on a weekend, because that's when you'll usually hear this question if you're Catholic. 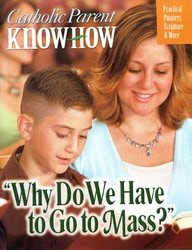 The Catholic Company sent me a copy of "Catholic Parent Know-How, Why Do We Have to Go To Mass" for my honest review. This is an 8 page pamphlet that contains many short articles explaining more about the Catholic faith and our reasons for attending Sunday mass. I choked a bit when I read in the introduction about answering "Because that's what this family does!" or "Because that's what the Church says we have to do!" I choked a bit because I have answered that way in the past when asked about attending Mass. This pamphlet provides information, answers and guidance so that the question can be answered in ways to "encourage and inspire." I especially liked the 2 page spread entitled "Ten Good Reasons to Go To Mass," as it provided simple, but thorough, reasons we choose to attend weekly Mass. Number 9 jumped out at me because it was "We need ritual in our lives." One of the things I tell my boys is that the ritual of Mass has always been very comforting to me - especially knowing that the Mass is performed the same way across the world, down to the exact same readings being read to everyone attending Catholic Mass. I also appreciated the short blurb about taking infants and toddlers to Mass. Right now, Lydia is a handful during Mass and we have struggled attending as a family. My husband and I have discussed splitting Mass times so that everyone except Lydia attends until she gets a bit older, but some friends have discouraged that approach. This article encouraged me as it mentioned that it is imperative that adults and children of the age of reason (7 years old) attend, but it is not imperative that younger children attend. Even if we attend once or twice a month as an entire family and split the family on the other weeks, I think it will be easier on all. I would recommend having this simple pamphlet in your home as part of religious instruction, and just available for those times when attending Mass seems a burden. It only costs $1.95, but I think it's worth much more! This review was written as part of the Catholic book Reviewer program from The Catholic Company. Visit The Catholic Company to find more information on Catholic Parent - Why Do We Have to Go to Mass-10.